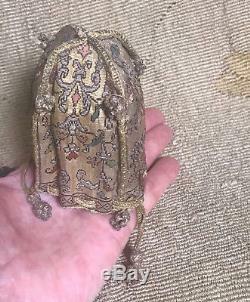 A very rare 17th Century Sweet Meat Purse. 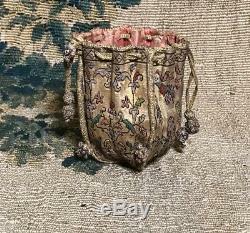 The lovely petite little drawstring purse is constructed of a fine gold metallic silk ground embroidered in coloured and Silver metallic threads. A plaited drawstring to the top with two hanging tassels. 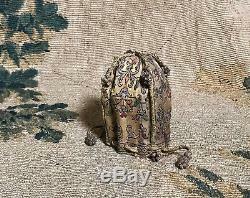 A further four bulbous tassels decorate the sides. 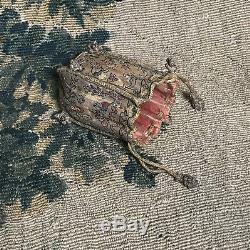 Pink silk lining These tiny purses were commonly used to hold sweet smelling herbs or sachets, since people seldom bathed. 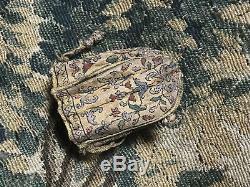 The purses were made from silk and velvet, and often embroidered in tent stitch. 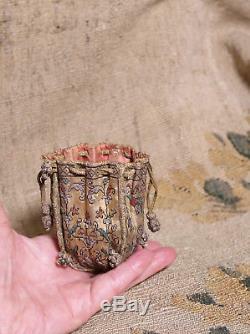 Plaited drawstrings and bulbous tassels hanging at the top sides were also characteristic of sweet meat purses. 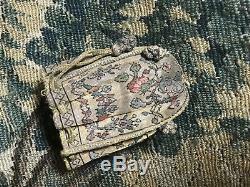 Good antique condition considering this little purse is approx three hundred and fifty years old It has been stores folded for centuries therefore two sides are slightly fresher than the other two I would not attempt to pull the drawstrings to close the purse as they may break Naturally has appropriate signs of wear commensurate with great age and use. 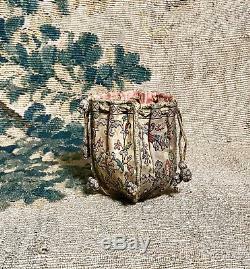 Please study the photographs as they do form a very important part of the description SIZE 3.5 inches high (9cm) x approx 3 inches across the top (9cm) A very similar example can be found in the V & A Museum London Described as being made in France The English Royal Collection also holds a very similar example. 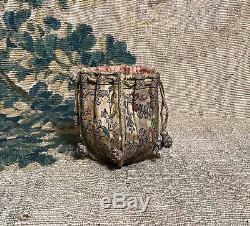 The item "Antique Sweet Meat Purse Metallic Silk Embroidered Bag C1660" is in sale since Wednesday, November 21, 2018.